There are few things I love more than a really wonderful story - be it told through words, movement or images. We all hold thousands of stories within us: tales of our own experiences walking this earth, familial lore, spiritual learnings and journeywork, imagined fairytales, wild dreams and daily (even mundane) actions. I love to think of my art as a continual process of "Building the Narrative of my Life." The work of my hands is a visible, tangible representation of my thoughts, and the way that I personally know best to weave the tale of my life. Now to be clear, this does not mean that every single piece of art is a deep, fully formed story! Some are full of meaning and rich lines of thought, for certain, but others are no more complicated than saying "what a beautiful sunrise" or "gosh I really love trilliums." Even work that is 100% abstract and created entirely through intuition is still a marker of who we are and when we made it. Every time we create, coming from that authentic place of checking in with ourselves, from building on previous work to stretching into unknown territory, we tell a little more on the story of us. For me, I also find this to be a place of great forgiveness with old work that I tend to decide is "lesser." I don't keep all of my old work (there are a great many paintings buried deep under layers of gesso, with newer paintings on top), but when I begin looking at (or thinking about) that older work through the lens of my story, I can see it as a marker in time, a chapter in my art. I may be glad that chapter is done, but it was still a necessary chapter to pass before I could begin the current one. I believe that no true artist is ever just "done learning," but that we have the capacity to continue learning, making and telling our stories up until the very end. Where we are right now is just one point on our path, there is work from our past that informs our now, and our present time will inform the work of our future. Really believing this allows me to slip free of the fear of non-perfection, or the thought that "this might not look exactly the way I envisioned it" because I believe this work is for right now, and there will be more work to create in my future. So how do we begin telling narratives, illustrating the story of our lives? The wonderfully convenient part is that you already have. All those lists of inspirations, all those field notes, all those marks and symbolism and color choices, the work of your hands you've which been creating over the last five weeks, ALL speak to your now and the story that currently surrounds you. This week we'll continue adding to them, but giving them a little push and embracing the idea of story. Because this week may be my very favorite week of all - I am a gal who adores storytelling - I'd like to introduce you to our homeplay today, rather than waiting until Friday. This is the kind of sketchbook work that can be done endlessly, and built upon with each of our lessons this week, so have fun, trust that you are exactly right where and when you need to be, and believe in your stories! I'd like you to think over your past week (or beyond) and choose three interesting moments (and note the word interesting - these could be super pleasurable, easy times that bought you happiness, but they could also just be a moment that has stuck in your mind, no matter the emotional association). They could be simple: practicing yoga every morning, an evening walk with the dogs, the feeling of brisk autumnal wind pressing the back of your neck, the hour you spent rearranging your mantle of natural objects d'art, or the feather you found laying in a parking lot. They could be complex: a long conversation with an old friend, a book that sparked an existential debate, the planning stages of a cross country road trip, or deep reading on the state of the food chain in the US (yes, these are all some of mine). Either way try to identify three moments and write them down in your sketchbook. Now we begin pulling out our whole bag of tricks: Think of these as your Field Notes. When you think about one of those moments, closing your eyes and checking in, what ideas, associations, emotions, memories arise? Do you want to describe it in detail with words? Are there any objects, shapes, images or pictures that appear in your mind? Are there any colors that stand out? Any marks, doodles, squiggles that can stand in? Feel free to check back in your previous sketchbook pages for any ideas that might want to pop up here. You may find yourself working towards a thought or idea that seems entirely removed from the original moment - but that's a beautiful thing! 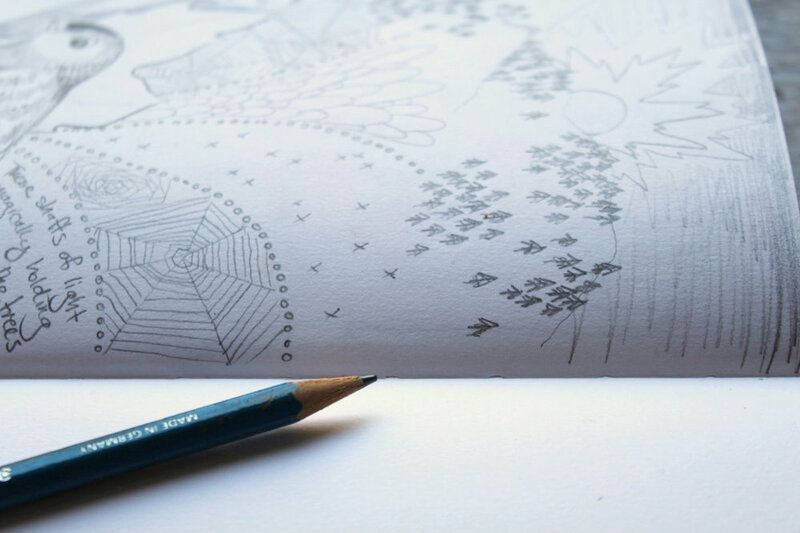 Put it all down in your sketchbook, adding and free associating as you go. Develop each "moment" as much as feels good - it you get stuck on one, move on to another. If you only come up with a couple small points, that's perfectly alright, because not every piece will have or needs a ton of deep meaning! Remember, sometimes all we need is a single color or shape to describe, and that single thing might be the most honest description of all. This may become a piece you want to create in your own medium, it may not. The important thing here is that we're notating the occurrences of our lives, giving them time, and asking how they inform us while we open up to the possibility of new art being born.